Tomato Trellis Netting reduces the mechanical contagion of phytopathogens. Produce better and more profitable crops with HORTOMALLAS tomato trellising net. In agriculture we all strive to find ways to increase our production both in terms of quality (i.e. 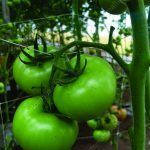 better paid crops) than in quantity produced, and that is where HORTOMALLAS tomato trellis netting comes in play. 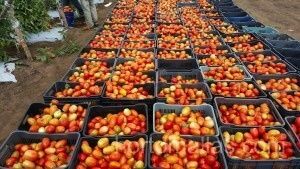 This cultural system will allow you to yield more tomatoes per hectare, both increasing plant density and improving phytosanitary conditions. Among the many reasons besides poor soil tomato crops can fail there are many variables we can control directly, such as reducing plant stress, improve aeration and reduce mechanical handling of the plants as this disturbance will increase the probability of transmitting diseases as, in poor phytosanitary protocols, the hands of the workers become vectors of pathogen transmission. With HORTOMALLAS tomato trellis netting you can reach a higher level of organic production. 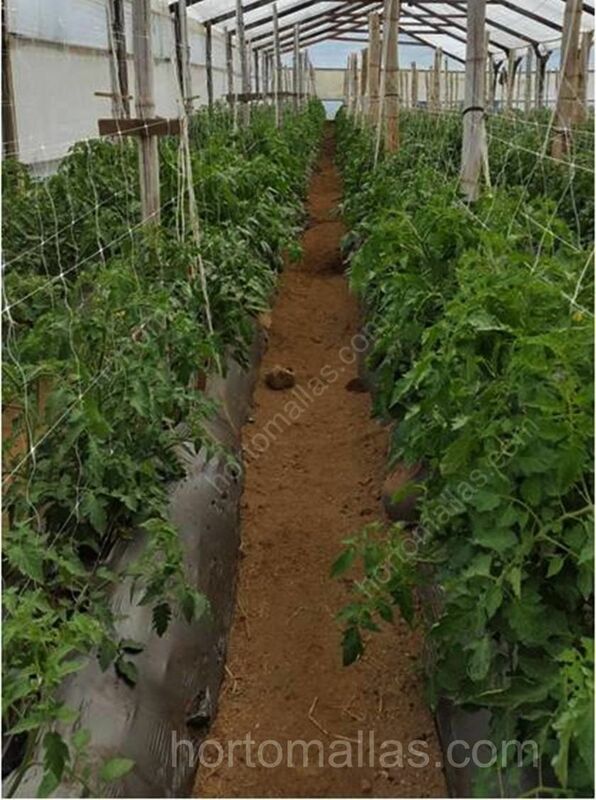 By installing HORTOMALLAS tomato trellis netting we verticalize the cultivation increasing the plant density and improving air flow among leaves. An increased air flow and a direct solar incidence to the foot of the plant will reduce humidity levels and therefore decrease fungal and other affections to the tomato plant. When using a double tomato trellis netting system with one wall of netting on each side of the furrow we further reduce any pathogens. 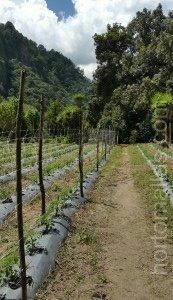 Buy allowing a plant training structure (effectively it becomes a huge tomato cage) that will support the tomatoes´plants on both directions we are able to eliminate or at least reduce considerably any friction and handling with the plants during the phase of training and guiding branches. Pathogens´ entry points due to abrasion and cuts are reduced as well as the plant´s stress levels, therefore thanks to trellis netting for tomatoes you increase your crop´s profitability. Diminishing the rate of infections then allows you to save money on agrochemicals. Less diseases mean less spraying (which means less money spent on chemicals, labor and gasoline) and most importantly less spraying means increasing your role and presence as an organic tomato producer, which converts in a higher price of tomatoes all thanks to tomato trellis netting. One more consideration about spraying, as the plant will be growing vertically with the proper side support, any spraying will reach the inner leaves of the plant making each application of chemicals more effective as it will leave less “safe areas” for pathogens. HORTOMALLAS tomato crop netting can also be installed as a traditional single wall for training plants. This system increases labor compared to the double wall one, but in any case it saves money as compared to tutoring and training tomatoes with raffia. The aspect most growers are concerned about is what plantation density can be achieved using HORTOMALLAS. Of course there is no standard formula but we can talk about specific case studies, since general variables are so different from case to case such as seeds, soils, winds, and relative humidity. But as an example a grower who used to plant determinate tomatoes in a single row with an interplant spacing of 50cm and a row (furrow) spacing of 1.8m, when using HORTOMALLAS tomato trellis netting converted his planting pattern to 1.2m in furrow spacing (space measured form furrow centers) and was able to implement a wider furrow (using the double netting wall) by planting in zig zag with a spacing of 50 cm. on the same side, with an extra plant in the middle but on the other side of the furrow). 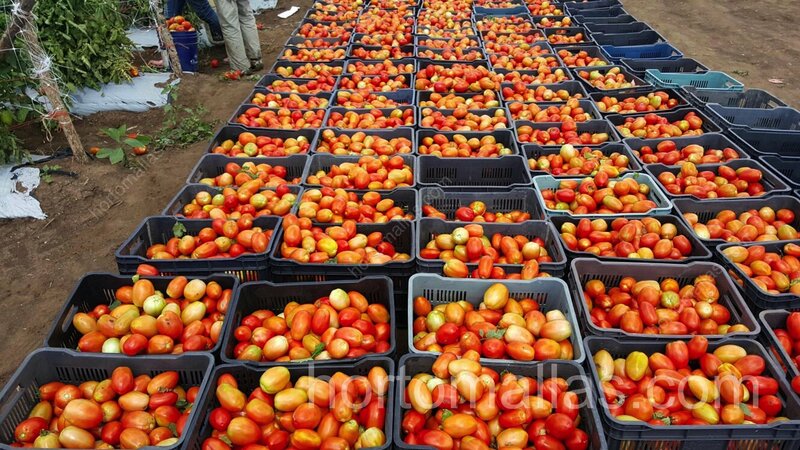 With good fertirrigation crop yields rose more than 40% thanks to tomato trellising net. 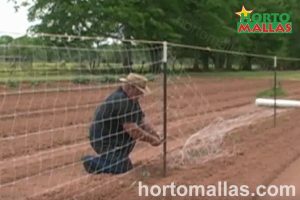 Installing HORTOMALLAS trellis netting for tomatoes is a easy work for any person. HORTOMALLAS tomato netting for trellises can be stored after the harvesting is over and used in the next cycle or left in place to place the next crop in, allowing crop rotation easily and distributing the fixed preparation costs of cultivation over many more crops.